Valentine's Day is tomorrow, and if you're anything like me - you're probably feeling like it snuck up out of nowhere. Wasn't it Christmas yesterday? Weren't we just celebrating Valentine's Day? How did we get here. I wouldn't call this recipe a particularly healthy recipe - but Valentine's Day is the perfect day to indulge and treat yourself. This is a recipe we've made dozens of times - but one I'd almost forgotten about until last week when World Nutella Day rolled around and we had a jar of Nutella sitting around that needed to be used up. These brownies are stupidly simple. 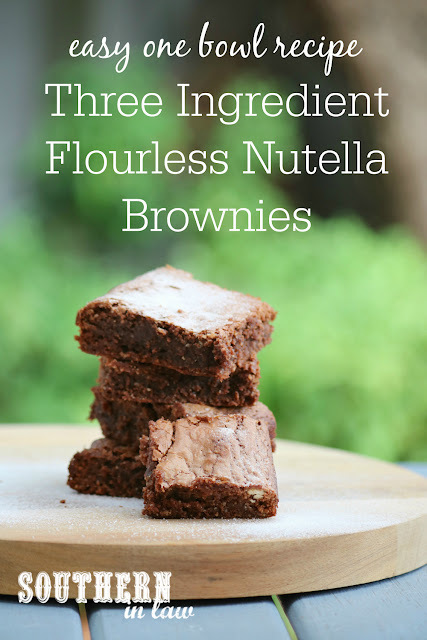 Using just THREE ingredients and no boxed cake mixes or weird hard to find ingredients, they can be mixed up and poured into a pan in just a few minutes and before you know it, you've got a tray of brownies ready to eat. A tray of brownies with gooey fudgy centres and crispy, chewy edges. Brownies so good that you'll have to hide them from your husband who would happily devour an entire tray in one sitting. Grease and/or line an 8" brownie tin and set aside (see below for other pan options). Mix your nutella, nut meal and eggs in a medium mixing bowl, mixing until combined. Pour your brownie mixture into your prepared tin (it will be quite thick and sticky) and evenly spread your mixture out in the pan with the back of a spoon or spatula. Once your brownie mixture is spread out in your pan, bake your brownies for 15-20 minutes or until the top is set and cracked and a skewer inserted into the middle removes with just a few crumbs. Allow your brownies to cool before slicing and serving. 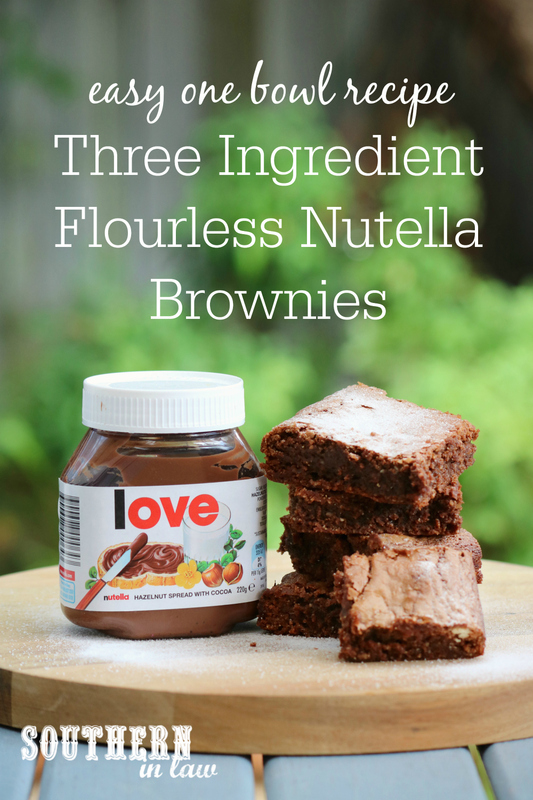 These brownies will keep in an airtight container at room temperature or in the fridge for 2-3 days. They can also be frozen (slice and wrap individually) to be defrosted and enjoyed later on. *Other Nutella Options: As well as using actual Nutella, I've tested this recipe with a bunch of different chocolate hazelnut spreads. From homebrand cheaper versions to Justin's Chocolate Hazelnut Butter, Chocmeister Spread (which has 25% less sugar and also comes in a Dark Chocolate Version) and Nutiva Organic Hazelnut Spread (which is vegan and dairy free and also comes in a Dark Chocolate Version). Basically you want to use a spread that has sugar and oil as well as cocoa and hazelnuts as that's what turns this from a three ingredient batter into ridiculously incredible brownies. Don't try and use sugar free versions or you'll end up with a recipe fail. Almond meal is a slightly cheaper option here, however, you can also make a non-flourless version with 1/2 cup gluten free plain flour or regular plain flour - we just prefer the nut meal version's texture! 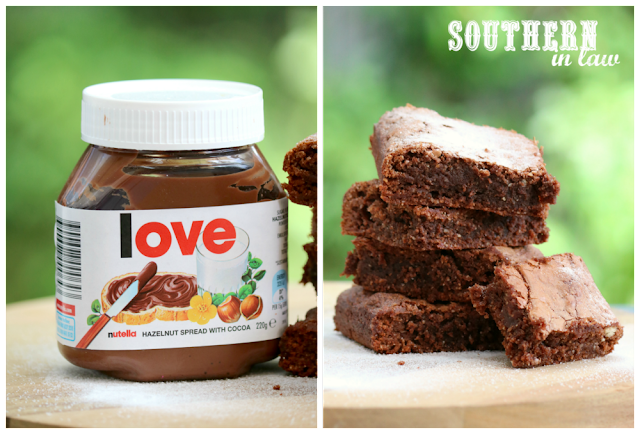 Below are some of my top picks for brownies. Straight edged tins will give you the best brownies and brownie bite/square muffin tins are perfect for edge lovers as every single piece will have four crispy, chewy edges. Click to shop or find out more. And what's Valentine's Day without gifts?! 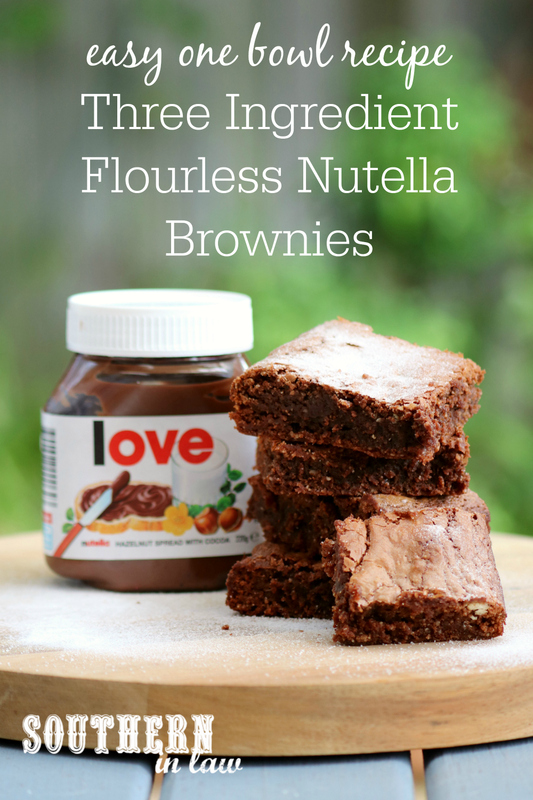 Here are some of my favourite Nutella Gift Ideas from around the web! Click to shop or find out more. But tell me, do you feel like Valentine's Day crept up on you too? And what's your current favourite sweet treat? We're celebrating Valentine's Day at home with a nice dinner and a chocolatey dessert (Jesse is requesting these but I want this healthy chocolate fudge recipe - so I think we'll have to have both! ).